Independent play is when your child is playing alone rather than with other children. This is common for children who are shy, without siblings or prefer to be alone. Your child is learning how to be self-reliant because he is entertaining himself. Group play is when children are playing together. This may be a puzzle, outdoor game or wooden toys. Group play teaches children how to be courteous when playing with others, such as taking turns and sharing toys. It also teaches them how to work together to reach a goal. Children are enhancing their communication and socialization skills through group play. Fantasy play is when children play games such as "school" or "restaurant." They are using their imagination to create their own games, and they are learning about different roles in the community. Fantasy play also helps them with communication and language development. Children learn how to be creative through constructive play, such as building a community with wooden blocks. Constructive play tests their problem-solving skills because they must fit the pieces together to build their town or road. It also helps them to improve their hand-eye coordination. Whether it is independent or constructive play, wooden toys are a big part of playtime for a child. Wood toys can include puzzles, cars, pretend food and building blocks. There are several benefits to choosing wooden toys for playtime. Wooden toys come in a variety of shapes, from sticks and blocks to food and vehicles. Children use the wooden pieces such as food to play "restaurant" and "grocery store." They can use pieces such as sticks to create their own shapes and structures. Your child may even use the basic shapes as other items. For example, colorful wooden circles become fruit or money for their specific game. The toys help children to develop and enhance a variety of skills. They need to use their problem-solving skills to put together a wooden puzzle or build a sturdy tower. They also enhance their fine motor skills as they twist, turn or grasp a wooden toy to make their ideas work. Smaller toys such as wooden beads or blocks help children to enhance their hand-eye coordination. Whether they are building a tower or threading the beads, wooden toys teach children how to focus on a specific task. With so much technology, apps, and screens it is easy for kids to develop shorter attention spans. Wood toys help with this. A wooden toy does not include any sound effects, which means your child has to come up with their own voices, sounds and music. When children are not distracted by built-in effects, they are able to use their imagination and thinking skills to tell their own stories or solve different problems. Wooden toys are durable, non-toxic products that are safe for your child. It is not easy to break a wooden toy, which means you do not have to worry about splinters, small pieces and sharp edges. They are also made with natural materials rather than harmful chemicals. If you are looking for eco-friendly toys for your children, you can never go wrong with wooden toys. Unlike wood, plastic often fills up the landfills because this material is not biodegradable. A wooden toy can be recycled rather than discarded. However don’t just buy any wood toy as it depends on the finish and paint that a company may use. 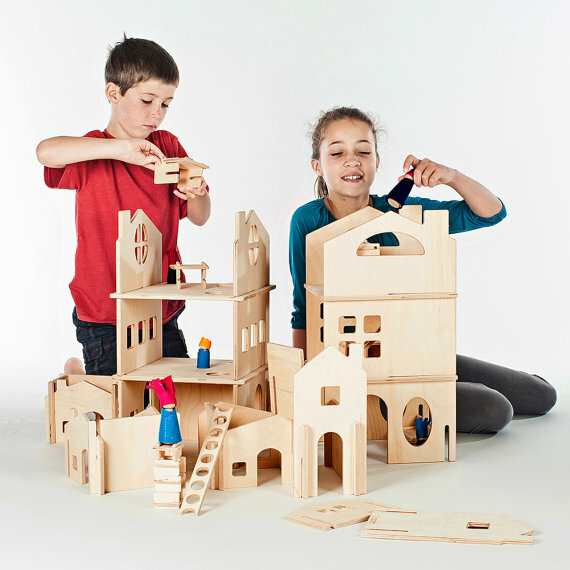 Use the wooden toys to teach your children the importance of having eco-friendly values. You can explain to your kids why a wooden toy is good for the environment, and point out how taking care of the environment is beneficial to the air, nature, animals and other people. Children who live an eco-friendly lifestyle are learning how to take care of the world around them! All Arwood Toys and Materials are toxic-free and made with eco-friendly practices!